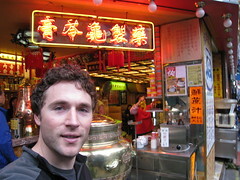 In Kowloon the street market seemed endless – dozens of blocks of little shops, restaurants, and vendors. The overall feel there was kind of run down. This was the first time we´d seen the thousands upon thousands of people we had been expecting here as the night came alive with market shoppers.